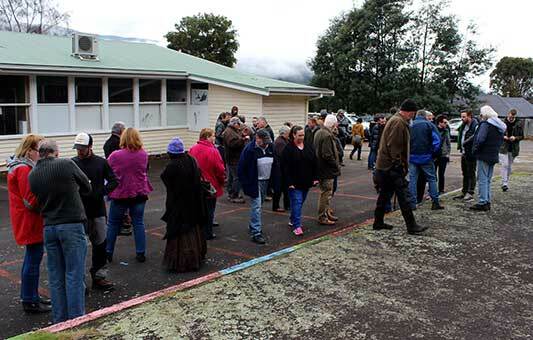 Part of the crowd at the old Maydena school on Saturday. 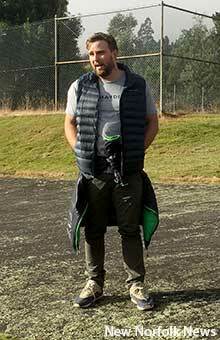 DEMAND for premium memberships had crashed the Maydena Bike Park website hours after the offer was launched on Friday, Dirt Art managing director Simon French told Maydena residents on Saturday morning. Speaking at an information session at the old Maydena Primary School, Mr French said it was clear there was a lot of interest from people keen to visit the mountain bike park when it opens at the end of January 2018. 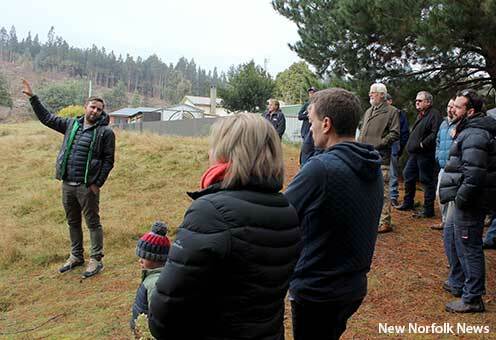 About 50 people attended the session, which provided local residents with an update on the project that will build a world-class mountain bike park high above the town. The park will open with 30km of trails for mountain bike riders, starting at an elevation of 820 metres. A further 90km of trails is planned. Mr French fielded a wide range of questions from people wanting to know more about the project which has been several years in the making, following a decision by the State Government to allow commercial development within Tasmania's national parks and World Heritage Areas. His company is in negotiations with the Derwent Valley Council to convert the old primary school into the hub of the bike park. Riders will be bussed from the school to the Eagle's Eyrie and will then ride down the adventure-based gravity trails which will arrive back at the school. The bike park will be on Crown land managed by the Parks and Wildlife Service and on land owned by papermaker Norske Skog. Mr French said his company had a 10+10+10+10-year lease on the Crown land and was close to finalising a lease with Norske Skog. He proposes to either lease or buy the school site from the council. In response to questions, Mr French said the bike park was a private development and the Derwent Valley Council had not been asked for any particular assistance, although it had been very supportive since the project was first announced two years ago. Answering another question he said the council had not charged any fees above and beyond those paid by any other developer. Mr French said there would be many benefits for the local community including free access to a number of services on the school site. "We will upgrade the school toilets, maintain the public toilet and build a new playground for the community," he said. There will also be several bike tracks and a skills development area for newer riders, which will be free to use. Existing community uses of the school site will be maintained into the future. The school site will include a small cafe that Mr French hopes will be supplied by local businesses and although he will be applying for a liquor licence there is no plan for a kitchen on the site. An a-la-carte cafe will operate at the Eagle's Eyrie. will approach the old Maydena Primary School. Answering questions about employment, Mr French said there would be at least 12 people involved in the construction phase as about 24 full-time-equivalent staff once the park is operational, including about six core staff. Full-time medical staff will be based at the hub and at the Eyrie. Maydena Bike Park will not be providing overnight accommodation to its customers but local providers will be invited to list their businesses on the official website. It may eventually be possible to book local accommodation through the same website, Mr French said. Once the park is open it is expected that about 200 tickets will be sold each day to transport riders to the Eagle's Eyrie. Sightseeing tickets will also be available and these will be offered to Maydena residents at half-price. Transport will be provided in 20-seat mini-buses. More information is available at maydenabikepark.com including the opportunity to sign up for email updates. An information session for business owners will be held at the school site at 6pm on August 21.